According to the new buildings permit database at www.metrohistory.com plans were filed with the New York City Dept. of Buildings in 1928 for construction of a five-story brick factory and laundry at 430-438 W. 54th St. These plans identified the owner as Henry Biandi / Super Service Laundry, 436 W. 57th St., and Jacob J. Gloster, 1440 Broadway, as architect. 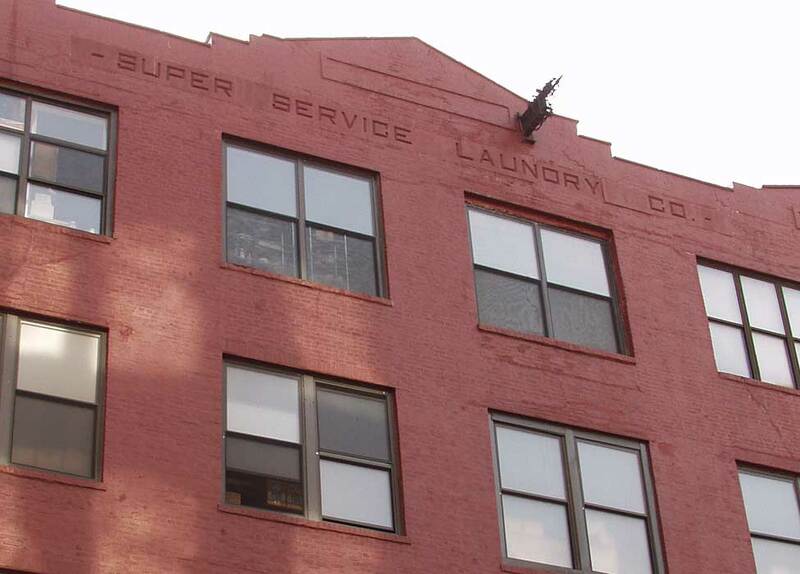 The Super Service Laundry Co. was listed in the Manhattan telephone directory at 430 W. 54th St. from 1929 to 1930. In 1931 the New York Times (16 June 1931) reported that the following individuals were filing for bankruptcy: Henry W. Biondi, laundryman, Gabriel J. Biondi, laundryman, and Cesira M. Biondi, housewife. The address for each was 430 W. 54th St. Their combined liabilities totaled $140,238, and their assets $1800. Prior to this location on West 54th St., Super Service Laundry was in business at 436 W. 57th St. under the name Prime Laundry. Trow's 1925 New York City Directory listed Prime Laundry's proprietor as Cesera M. Beondi, living at 470 E. 134th St. The owner identified as Henry Biandi on the new building application was Henry W. Biondi found in the New York State census living at 6 Case St., Elmhurst, Queens, in 1925. At that time he was the 18-year-old son of Gabriel J. Biondi, an immigrant from Italy ca. 1894. In 1925 Gabriel Biondi was 51 years old, born Italy, in U. S. 31 years, naturalized 1899. His occupation was Laundryman. His wife's name seems to read "Ciscela." Gabriel Biondi appeared in the 1910 U. S. Census living in Madison, New Jersey. He was 41 years old, born Italy, immigrated 1893. His occupation was "Merchant, Grocer." In 1920 Gabriel Biondi lived at 470 East 134th St., the Bronx. Now he was 50 years old, born Italy, immigrated 1894, naturalized 1900, and his occupation was "Canning Fruits." His son, Henry, was 13 years old. His wife's name was Jessie. Henry Biondi can also be found in the 1930 and 1940 U. S. Census reports. To confuse matters somewhat, Gabriel Biondi, was named Henry Biondi, age 61, in the 1930 census, where his occupation was given as "Proprietor, Steam Laundry." In 1930 Henry Biondi, the son, was 23 years old, born New Jersey, and his occupation was "Manager Steam Laundry." In 1940 Henry Biondi, age 33, lived in Jackson Heights, Queens. His occupation was "manager, hand laundry." Also living with the family were his widowed mother, Jessie, age 67, and his sister, Lillian, age 35. In the years 1940 through 1945, Super Service Laundry was once again listed in the Manhattan telephone directory at 430 W. 54th St. I have not been able to determine if the Biondis were proprietors of the resurrected business.